If you’re a hard gainer or an ectomorph, you completely understand how difficult it is to put on weight. Eating more sounds simple enough in theory. However, in practice, it can be quite difficult if you are not used to it, as such, this is where mass gainers (or weight gainers) can come in handy. However, mass gainers are not all made equal. Some are developed specifically for lean gains, while others are on the complete opposite end of the spectrum. Mass gainers for hard gainers are designed to help those people gain weight through brute force, and frankly, this is what they need. This is a list of the top 5 best high calorie mass gainers for the skinny guy. Optimum Serious Mass is synonymous with high calorie mass gainers. It is the top selling high calorie mass gainer, and for good reason. For around the $100 mark, you can get yourself a large 5.45 kg bag, which contains a total of 20,000 calories. That’s correct, twenty thousand! To put it more into perspective, each serve contains a massive 1250 calories (if made up with water), 50 g protein, 254 carbs, 21 g sugar, and 4 g fat. On top of this is a complete spectrum of vitamins and minerals, and some extra goodies such as creatine. Henceforth, Serious Mass is the benchmark to compare all the other products on this list. One downside to Serious Mass though, is that it is quite high in lactose. If you are lactose intolerant, consuming a full serve of this product is most likely to cause gastrointestinal distress. The Muscle Juice name has been around for quite a few years. The initial complaint was that the original Muscle Juice was too high in sugar. This is why Ultimate Nutrition took the criticism and then developed Muscle Juice Revolution, a low sugar variety of the original Muscle Juice. This high calorie gainer contains a more than respectable 1020 calories per serve, together with 56 g protein, 170 g carbs, 18 g sugar, and 14 g fat. The protein blend is made up of a very comprehensive mix of different high quality proteins to help sustain muscle building over a longer period. It has a thin, easy to drink texture and a delicious taste that almost makes weight gain easy. 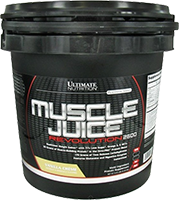 Muscle Juice Revolution is priced similarly to Serious Mass. However, you do get a product that is half a kilo lighter. Regardless, you still get a solid 19,245 calories per tub. It looks like Optimum’s sibling company, BSN, is out to show its bigger brother a thing or two. BSN has, more recently, developed a high calorie mass gainer to rival Optimum’s Serious Mass. Right off the bat, we have to admit True Mass 1200 is a superior formula. A serve provides a similar 1230 calories, but what differentiates it is how the calories are provided. Compared to Serious Mass, True Mass contains a more complex carb blend, a more complete and premium protein blend, and far less lactose. Each serve provides 50 g protein, 222 g carbs, 16 g sugar, and 16 g fat. Again, True Mass 1200 is similarly priced to Serious Mass. However you get a full kilo less powder. This is no surprise given that the raw ingredients are far more expensive than those used in Serious Mass. Dymatize have always been a thorn in Optimum’s side. It is clear that Super Mass Gainer was modelled after Serious Mass. However, in this case, Dymatize have made a product with significant improvements over the fan favourite. The figures are fairly typical; 1280 calories, 52 g protein, 252 g carbs, 19 g sugar, 10 g fat. So what you say? Check out the protein matrix. It is possibly one of the only high calorie mass gainers in existence that uses whey protein isolate as the first ingredient. Most competitors prefer to use a cheaper form of protein, but Dymatize have gone all out. Despite this, Super Mass Gainer comes in a size just as big as Optimum, without being more expensive. Super Mass Gainer is one of the most under rated high calorie mass gainers around. Though, that probably is not the biggest surprise given that Dymatize has always been somewhat of the underdog. Although not as popular as Serious Mass, Mutant Mass has a cult following. People who know what’s what, immediately jump for a big bag of Mutant Mass. Overall, it may be the best formulated high calorie mass gainers on the market. It contains 1060 calories, 52 g protein, 176 g carbs, 34 g sugar, and 18 g fat. Each of these macronutrients are provided by a comprehensive and well thought out blend of high quality (and expensive) ingredients. Perhaps one of the most impressive attributes of Mutant Mass is the fact that it is not bloating. Unlike some of its competitors, you can feel hungry fairly soon after downing 500 calories of Mutant Mass. This is a huge advantage if you want to make sure you are able to eat enough food for the rest of the day. 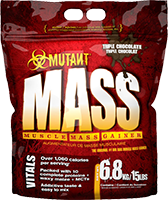 Yes, Mutant Mass is somewhat more expensive than Serious Mass, but it is also comes in a significantly larger bag – a huge 6.8 kg. In total, this bag provides 27,700 high quality calories. Beat that!